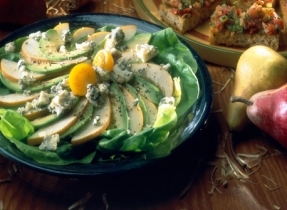 Blue cheeses can be presented with fruit, especially pears or bread. Find out how to pair cheese with produce. Core and thinly slice apples. Combine with salad greens in a large bowl and toss with dressing. 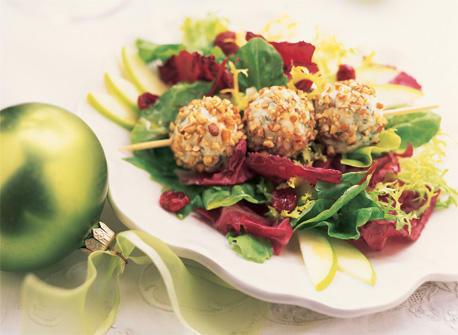 Divide salad among 6 chilled plates, top with a skewer of Cheese truffles and garnish with sweetened dried cranberries, if desired. To serve Cheese Truffles as an hors-d'oeuvre, place each one in a small fluted paper cup. 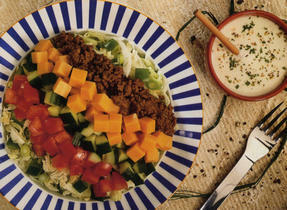 Garnish with sweet pepper or fresh herbs and place on a cheese tray. Cheese Truffles can be prepared ahead and stored in the refrigerator for up to 2 days before serving. Remove from the fridge 1/2 hour before serving and roll in chopped nuts. 60 people love this recipe.